Books on First Blog: March to April May Bring June Winds, Showers and Flowers, Did July? March to April May Bring June Winds, Showers and Flowers, Did July? plus the best broccoli ever. Larry is a most enthusiastic gardener and over the years we have all been grateful recipients of the results. Huge, stunningly beautiful and headily fragrant Oriental lilies have graced the window counters of BoF. We have shared our abundance of vegetables with customer friends and they have reciprocated. Juana of Salamandra's has just shared her family's favorite way to eat zucchini flowers (to whom we hope to be able to give a few this year). This year, the weather has been weird, with very cool weather all the way to June. In June, we have experienced torrential rainfall as well as mere sprinklings, very windy days and nights and 90°F days and chilly nights. Flash floods, threat of tornados, oh my! But, as mentioned, they were perfect conditions for perfect broccoli. Also in June was a Friday the 13th with the closest full moon to the earth since 1919, and it won't be this close again for another 84 years (again on 13 June!). 13 June was also the ceremony for the second graduating class of the Chicago High School for the Arts, also known as ChiArts, of which the eldest granddaughter Ruby Dunphy is a member. This was a great June and it promises to be an even better July, no lie! 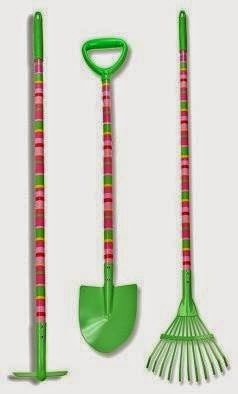 Besides Melissa & Doug kids' long garden tools (hoes, rakes and spades) on sale at 50% off, we have lots of gardening books for young and old. If you prefer armchair gardening, come in to Books on First and keep your hands clean!